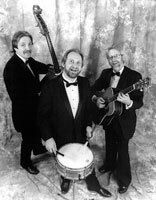 A popular Lincoln-based trio, The Lightning Bugs, will present a concert at 3 p.m. this Sunday, Nov. 16, at Zion Lutheran Church in Albion under sponsorship of the Albion Area Arts Council. The Lightning Bugs will also perform a “mini concert” for residents at the Good Samaritan nursing home in Albion. Some of the group’s favorites are hits by the Mills Brothers, including Glow Worm, Yellow Bird and Paper Moon.